Shoppers – No need to log in to shop. Which Lessons are Best for You? It’s fun to see how different student/customers change up the idea a bit when making their own basket weave carvings. The result is that each person’s creations are unique. Customer Student Julio Di Filippo, who carves as a hobby, has had some fun experimenting with the different looks possible with the basket weave pattern. He’s made a vase, a basket and a bowl, each with his own special touches. 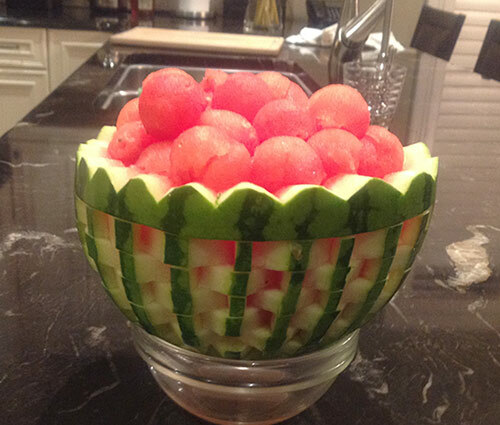 Student Customer Julio Di Filippo made this beautiful watermelon arrangement. 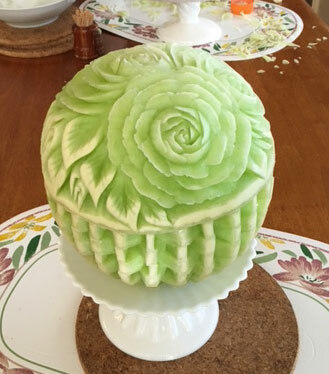 He carved the basket weave pattern into a watermelon leaving some of the outer green rind. He then used it as a vase to hold skewered fruit flower arrangement. Gorgeous, isn’t it? On this one, Julio Di Filippo carved a wide scalloped top edge with the basket weave below it to make a bowl filled with melon balls. Here’s another variation of the idea by Julio Di Filippo. He made a honeydew basket with a handle. He decorated the top rim and handle with grapes held on with toothpicks. Then filled it with fruit kabobs. 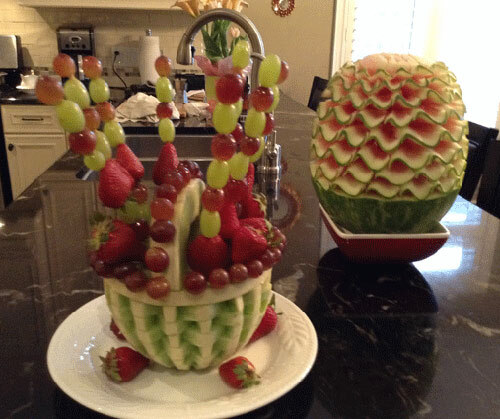 The watermelon carving that you see on the right is taught in our Scroll Pattern video lessons. Combining the Basket Weave Pattern with Flowers taught in other video lessons. 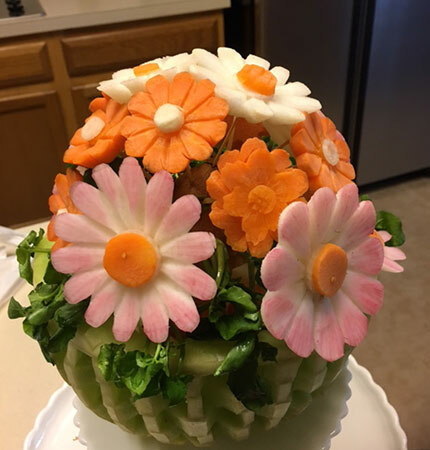 Customer / student Diep Tran carved the basket weave pattern on the bottom help of this honeydew and carve flowers and leaves on the top as taught in our Roses, Buds and Leaves Lessons. Diep did a beautiful job on this, don’t you think? This is my third time to do this basket. I finally made it, just in time for my daughter 32th birthday. 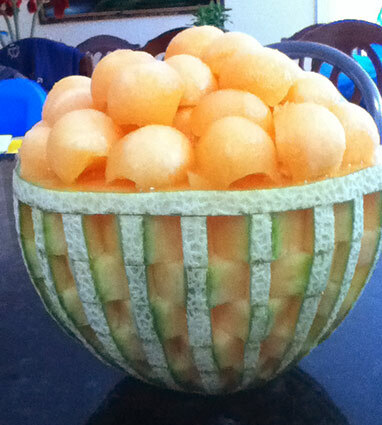 This is a look at another angle of Diep’s melon basket carving. Six days later, I received the following note and photo from Diep. After eating the flower basket I save the basket. I carved daisy flowers and make into new veggie basket. I am so excited and want to share this photo with you. Diep ate the top of her basket show above and reused the honeydew basket adding pretty vegetable flowers. 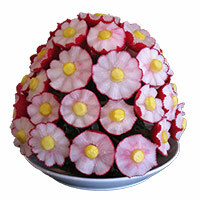 The root vegetable daisies added to this basket are taught in the video lessons Amazing Carving with Jimmy Zhang. 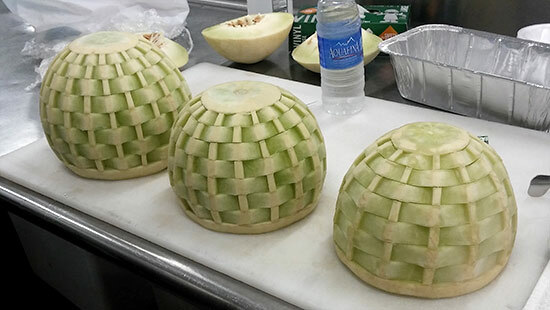 Pro carver and past student Chef Ric Testani made several honeydew baskets to add to some buffet tables. 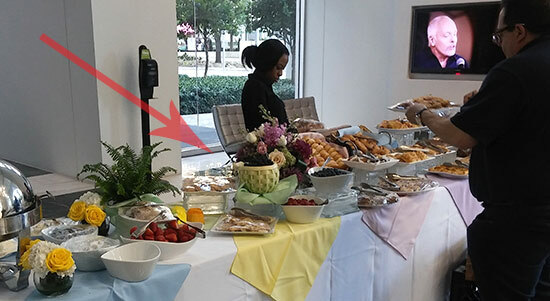 Ric used his honeydew melon baskets to hold berries in his buffet table layout. I love this basket lesson it’s great. Not to mention “no one” can teach it like you. I had a blast carving this and everyone went crazy over this basket carving. It is truly a work of art and looks so hard to do. You made it so simple to watch the lesson and in no time it was done and perfect. Your step by step lesson is so perfect for any level carver. You are the best teacher. Tonight I brought home 3 cantaloupes and 3 honeydew melons to carve in to baskets for morning. I recommend your lessons to everyone and this is a must try for sure. Anna Nguyen started by making the cantaloupe melon basket leaving the rind on. 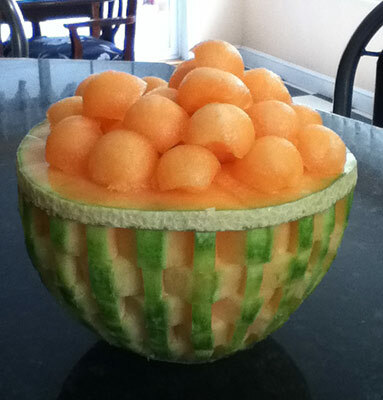 Anna then removed the outer rind leaving the inner green rind to produce this cantaloupe bowl. Which look do you like better? As you can see from these student photos of basket weave carvings, you can use variations of the same carving technique on honeydews, cantaloupes, and watermelons to make bowls, vases and baskets and more. 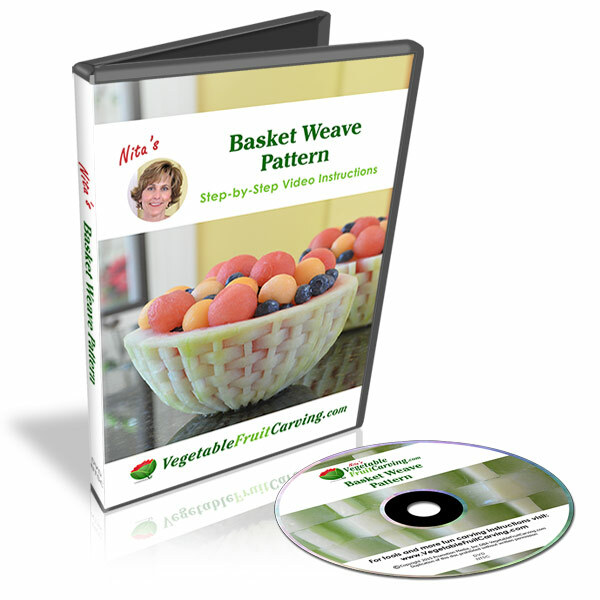 You’ll get step by step instructions for carving the Basket Weave pattern in our Melon Basket Weave video lessons that you’ll find in our online shop. Our Thai Pro Knife or Dual Blade Knife is recommended for this carving. 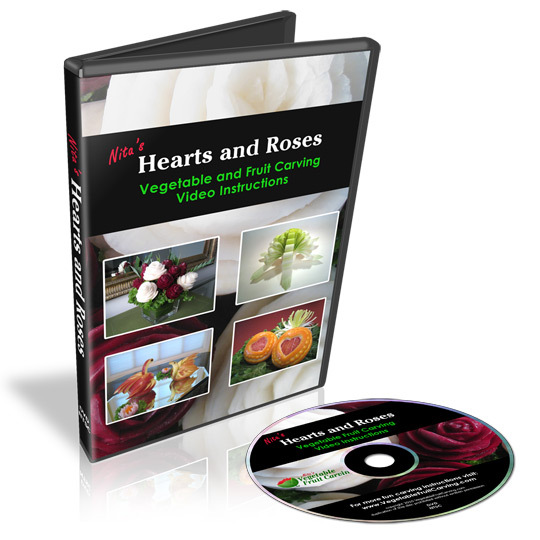 Nita Gill has been producing detailed, high quality, step-by-step video lessons that teach the art of fruit carving since 2009. Nita has won competitions, judged competitions, appeared on TV and has even carved at the White House. She is pleased to now have thousands happy carving customer/ students in over 60 countries who have taken her video lesson that are designed like live classes, answering the questions that you'll have as you learn to carve. Like us on Facebook. Follow us on your favorite social networking sites. Thank you so much for everything I purchase as well as the ideas you send. I can tell how much fun you have with it; I do too. Thank you again and again! Nita is inviting you into the world of fruit and vegetable carving. 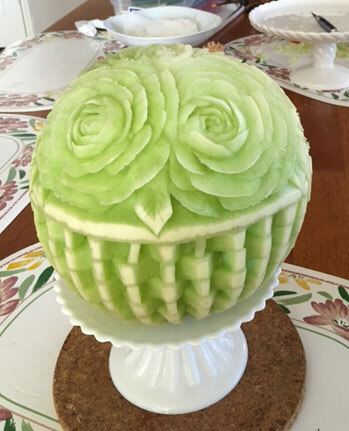 You'll join thousands of others who've become watermelon carving and fruit carving experts using Nita's simple and easy-to-follow food art instructions! 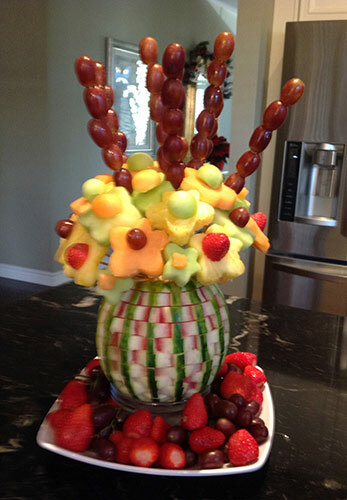 Her how to garnish & melon carving video lessons will show you how to sculpt beautiful fruit bouquets & arrangements! Create spooky pumpkin carving creations this Halloween. Get Started with Carving Fun. Get a free sample lesson now. Plus seasonal ideas to add WOW to your table.